The hardest part about rye is figuring out exactly what you need for a recipe. Like wheat, it is readily available in many forms including flake, berry, meal, and flour. 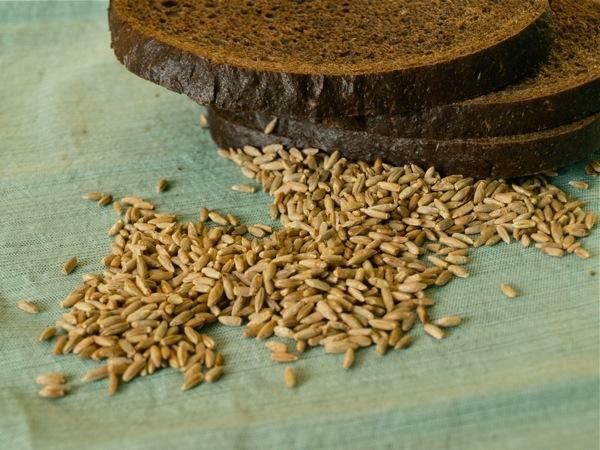 Rye flours can be sold as dark, medium dark, white rye, pumpernickel, or creamy depending on how fine the grains have been ground and how much of the bran is included in the final product. It’s enough to make an experienced bread-maker’s head spin! Despite challenges in choosing the right rye, there are some strong benefits to including it regularly in your diet. Rye is high in fiber, low in gluten, and its helps maintain a full feeling for longer after meals. Some folks even consider dark rye a superfood. Sprouted Rye Berries – Buy rye berries in bulk and use a sprouting kit to create nutty, crunchy toppings to salads and sandwiches. Rye Croutons – Cube and bake a crusty loaf of rye bread seasoned with olive oil and Italian herbs to make homemade croutons. They’re heartier than a white bread crouton and perfect with a late winter soup. Rye Crusted Fish Fillets- Place a slice of rye bread toast in the food processer and gently pulse to make bread crumbs. Mix with salt and pepper and favorite fish seasonings and use as breading for a pan-fried fish fillet. Rye bread crumbs can also be used for pork tenderloin medallions. 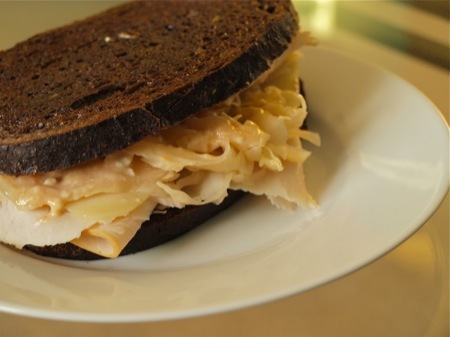 Reuben or Rachel (see photo)- A personal favorite way to enjoy rye! There’s something iconic about sitting down for a lunch of corned beef or turkey, sauerkraut, and swiss cheese all sandwiched between hearty slices of dark rye bread with thousand island or russian dressing. Rye Gnocchi – Instead of white flour, use light or medium rye flour for hand-rolled gnocchi. Serve in cream sauce or lightly buttered with garlic and parmesan. Artisan Rye Crackers – Replace equal proportions of dark rye and white flour for flour in your favorite cracker or flat bread recipe. Rolled out thin and baked until crisp these are perfect for dips and spreads. Rye Berry Salad –Boil 1 cup of rye berries in water until tender. Cool and mix with feta, cucumber, garlic, green onion, black olive and minced fresh herbs. Drizzle with lemon juice, red-wine vinegar and olive oil for a quick Greek-inspired salad. Rye Stuffing –Cube sliced rye bread and toast on a baking sheet until crisp. Mix in a skillet with mushrooms, onion, and celery for a vegetarian stuffing for squash, or add spicy Italian sausage for stuffing poultry or pork. Amy Sippl is a frequent contributor to Simple, Good, and Tasty. She grew up in rural Wisconsin, but now calls St. Paul her home. She writes about her successes and struggles to eat and grow local food on her blog: Minnesota Locavore. Her last article for us was: Is Millet just for the birds?